Can you solve this APPLE QUIZ? Best Math Puzzles & Riddles Images! Can you solve this APPLE QUIZ? Math Puzzles Pictures! Hello Everyone, Here’s an interesting Math Puzzles for you. Can you find the Answer of this APPLE QUIZ? 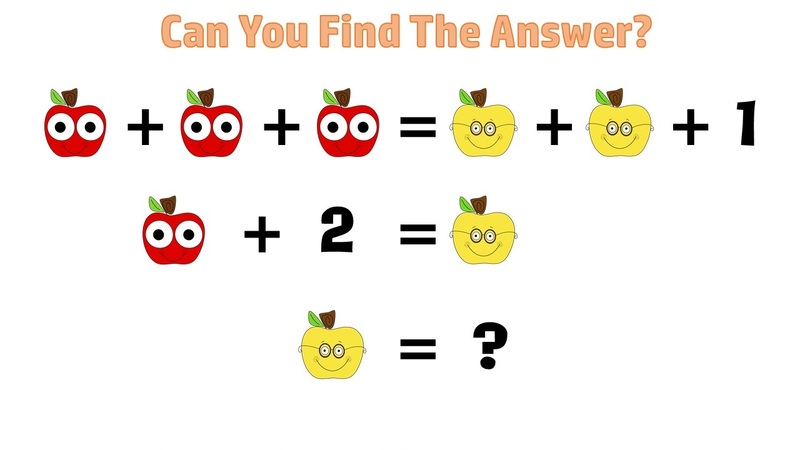 Apple Quiz Math Puzzles Pictures. In this Pictures, you have to find the answer of YELLOW APPLE! What’s the value of the yellow apple. The Answer and the Solution Given Below! Can You Find the Answer of this APPLE Quiz Puzzle ? Put 2nd equa. into 1st !! Put “a” Value in 2nd EQUATION !